On January 1st, 1995 my parents bundled me up in a tiny down snowsuit, settled me into the seat of a forest green backpack, and set off on snowshoes from Holland Lake in Montana’s Swan Valley, towards the South Fork of Flathead River deep in the heart of the Bob Marshall Wilderness. My dad, a fifth generation Montanan, had spent the past decade packing horses and mules into the Bob Marshall during the summer months, and trapping the same drainages when the snow fell. He met my mom, a member of the Blackfeet Nation from northwestern Montana, in the early 90s and I came along in the spring of 1993. We lived on a small off-grid homestead in the foothills of the Mission Mountains and my parents love for wild country and desire to live simply and close to the land was a strong force in our family from the beginning. Initially they had intended for my birth to take place in the wilderness, a plan which was quickly overridden by an interception of concerned grandparents. The compromise was to instead plan a four-month winter trip into the heart of the Bob Marshall Wilderness where we would live in a tipi from January through April. The ranger at that time knew my dad from his years in the backcountry and arranged to allow for the last pack string of the season to stash our tipi, along with a few pack boxes worth of rations and cloth diapers near Big Prairie, along the banks of the South Fork of the Flathead River. I was 18 months old when we set off on that 35 mile trek through conditions that would range from 40°F and raining, to -40°F and too cold to travel. It took 14 days to snowshoe up and over Holland Pass, and follow Gordon Creek to its confluence with the South Fork. I don’t remember that part of the journey, but am assured through stories that I scavenged all of the m&m’s out of our trail mix and that my first new word on the trip was “avalanche”. My parents describe that winter as a mosaic of hard work – chopping firewood, catching and smoking fish, washing long underwear and cloth diapers, and generally working to survive – punctuated by exploring ponderosa pine stands and dense forests, watching herds of hundreds of elk move across Big Prairie, and spending days along the banks of the river watching winter slowly melt into spring. I learned what it felt like to hold a cutthroat trout and that the small patches of waxy leaves which would later have red berries were called “kinnikinnick”. In late April, as the ice melted away from river-worn rocks and the first patches of bare ground strewn with last years golden larch needles began to show, we packed up and hiked once more to the mouth of Gordon Creek. I was nestled into the pack on my moms back, content with a great view, a steady supply of elk jerky, and watching our two canine companions, Bob and Skookum, scout the trail up Gordon Creek and over Holland Pass. 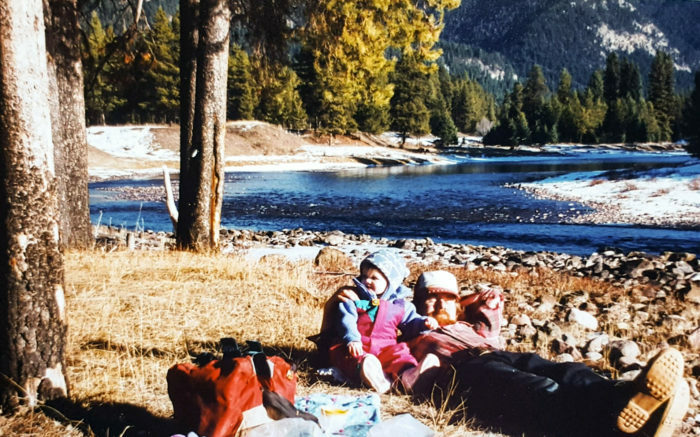 My memories of the those four months along the banks of the South Fork of the Flathead River are woven together by stories that I still love listening to while curled up next to a wood stove, and the photographs that bring them to life. I have my parents to thank for instilling in me a love and reverence for wild places, beginning with the mountains and rivers of my youth. Before I knew what the word “wild” meant, I knew what it felt like. Before I knew that rivers had names, I knew what it sounded like to fall asleep to the sound of rushing water. It’s been over 23 years since I stood at the banks of the South Fork near Big Prairie. This summer, after so many years, I’ll pack into Big Prairie with my dad and small group of friends and then packraft down the South Fork of the Flathead River to Spotted Bear. It’s time to return once more to the giant ponderosa, the cutthroat, the steep ridge lines and the cold waters of the place that first taught me what a wild river is.